Yes, I am the Unplanned Homeschooler, but when it comes to fire safety, I believe strongly in planning ahead. In fact, there may be nothing more likely to save your family's lives in the case of an emergency than having a good plan and running enough drills so that everyone knows what to do automatically. That's why I would like to recommend to each and every one of my readers, please schedule a night time fire drill for your family. You never know how your kids will actually react to a fire alarm when they are sleeping until you see the results for yourself. I did, and it was terrifying. If you think your kids know what to do in case of an emergency, you are not alone. I thought so, too, until last year. I’d gone over lots of scenarios with them, from fires and tornadoes to injuries and intruders, and I really thought they knew what to do if an emergency should arise. One emergency situation we'd talked about at length, but not actually practiced how to address was a fire at night. I did some research on fire drills, and found the Home Fire Drill website, with videos of how children really reacted to night time fire drills. The videos were frightening. Some children slept right through the alarms of the smoke detector, and others failed to do what they were taught in daytime drills. Still, I was confident that my own children would do better in a night time fire drill than the kids in the videos. 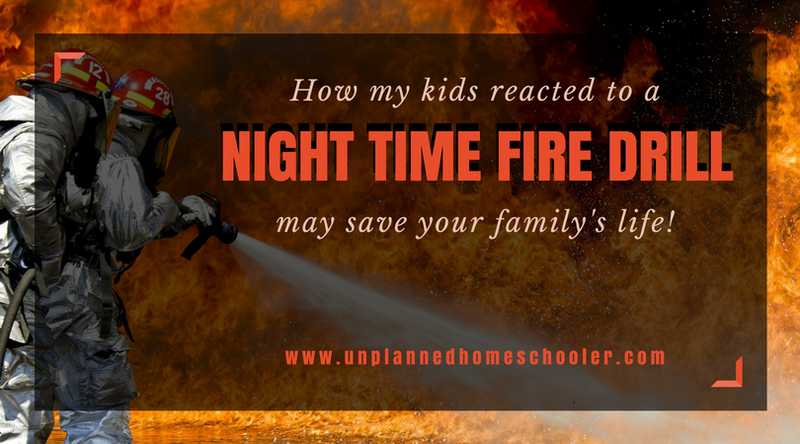 I had done more than a lot of parents to prepare my children for a fire, primarily because we live in a split level home and the kids’ bedrooms do not have windows. Their avenues of escape are limited, so it's even more important that they know what to do in case of a fire. Also, my grandmother died in a fire when I was ten years old, so I have always taken fire safety very seriously. I thought that running through fire scenarios, planning escape routes and learning safety procedures from the fire department would be enough. We discussed our safety plan regularly, and updated it as the children grew older. Unfortunately, I learned last night all the daytime preparation in the world is no substitute for a night time drill, performed after your children have been asleep for a while. I had to suppress the giggles as I sneaked downstairs to set off the smoke alarm. I thought for sure my twins would come running out of their rooms in confusion, but then quickly remember the fire escape plan. My amusement quickly faded as the smoke alarm blared and neither child made a sound. Approximately 30 seconds went by before my daughter moaned incoherently. Several more seconds went by as my daughter whined, “Turn in off,” in a mumbling voice about half a dozen times. A fear settled like a stone in my stomach as I imagined what would happen in the case of a real fire. Finally, my daughter called out in a sleepy cry for her brother. When he heard her say his name, he immediately jumped out of bed. By then, it had been more than a full minute since the alarm started. In a real fire, you may have only a couple of minutes to escape. My son saw me in the hall between their rooms and asked what was going on. I said, “Fire! Get out!” He acted very confused and just stood still. I said again, “Fire! Get your sister and get out!” Had the danger been real, he would not have had those verbal instructions. My son went into my daughter’s room, but neither of them came out until I yelled one more time, “Get out! Fire!” Finally they came stumbling out of the room, neither of them ducking low to avoid smoke inhalation. They went up the stairs instead of out the back door, the planned route to safety we had so often discussed. According to the Home Fire Drill website, approximately 50 percent of people who die in fires were actively trying to escape. But in a real fire, you have only two or three minutes to exit the house before you die. If my children reacted to a real fire as they did in the drill, they would have definitely died. This reality scares me, but it also motivates me to hold more fire drills while the kids are asleep, until their subconscious mind is trained to react to the sound of the smoke alarm and they know instinctively what to do. Please take my family's experience to heart if you have children. Hold a fire drill of your own, a couple of hours after your children go to bed when they are most likely to be in a state of deep sleep. If your kids need improvement, give them the chance to learn the right responses before a real emergency occurs. And share this information with other families you know. It just might save their lives. 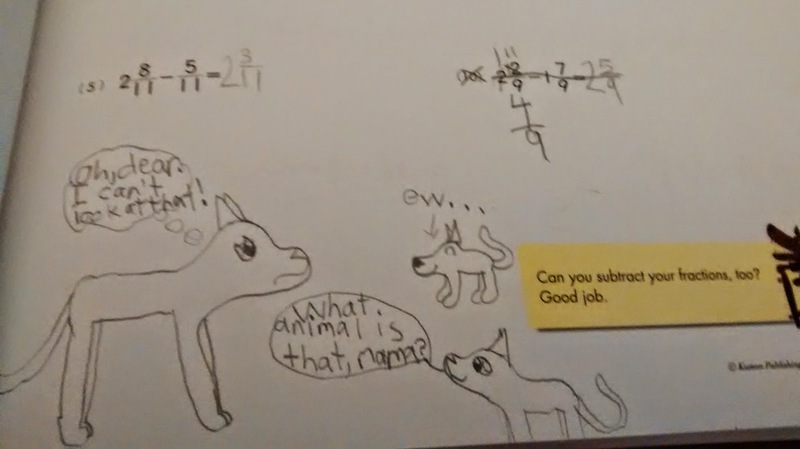 This week, I followed a discussion on Facebook about kids doodling on their homework. 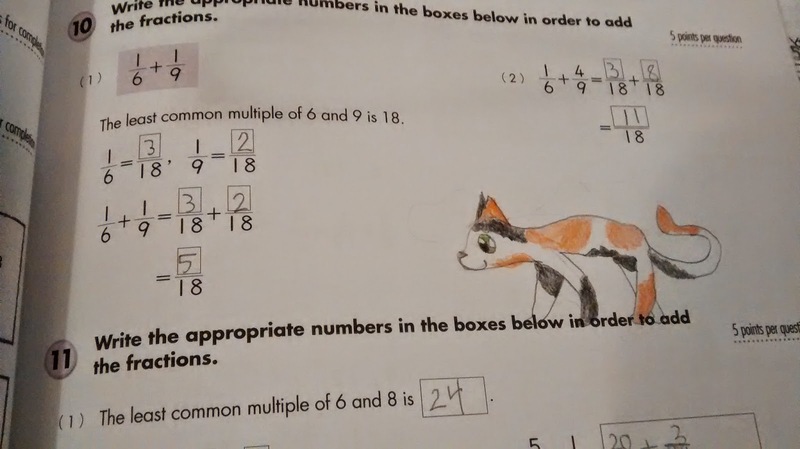 Some homeschooling moms strictly prohibited the practice, while others thought it was just fine, and most agreed that a little doodling doesn't hurt anything as long as it doesn't cover up the student's work. 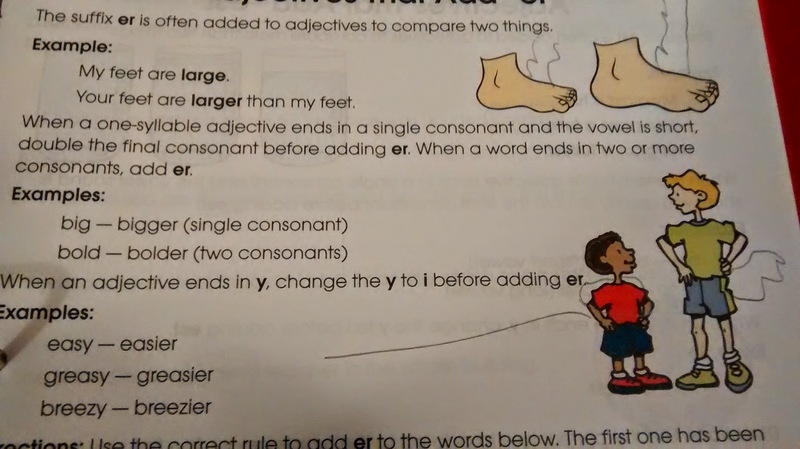 I love that most of the worksheets my kids have done over the years have plenty of extra white space. I've found miscellaneous doodles, poems, jokes and sometimes even carefully thought out scenes that traverse the whole page. Those extra marks on the page never failed to make me smile, as they revealed my kids' personalities, their creativity, and their budding senses of humor. 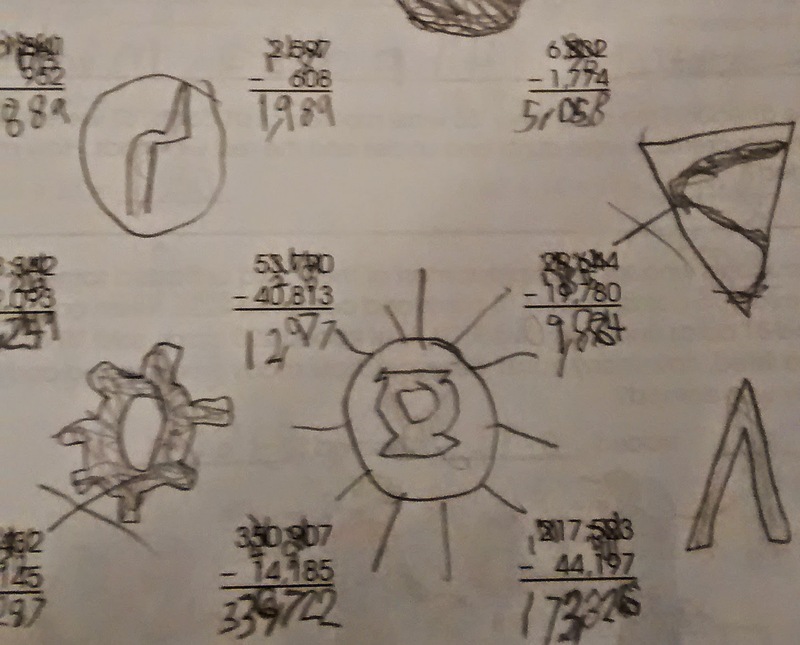 Now that my twins are in middle school, when I look back at their binders of elementary school work, I couldn't care less about seeing 8+4=12. But I LOVE seeing my daughter's evolving skill at drawing animals, my son's amazing superhero adventures, and both of their fascinations with goofy jokes. Doodling is good for your brain! Some of the moms in the Facebook discussion recommended a TED Talk, by Sunni Brown, who purports that doodling is a powerful tool to help boost your learning power. This article in Psychology Today expands on the video, explaining Brown's research and going into greater detail about exactly how doodling can improve memory and help students retain more information as they work. Many homeschoolers already incorporate music and movement into their routine, to help auditory and kinesthetic learners better absorb the material they are trying to master. Why not allow doodles, too? I appreciate a sharp presentation, with crisp margins and clean lines. There is definitely a time and place for neatness, and students do need to learn how to put together a clean report and how not to doodle all over an important test. But worksheets are for practice, not for show. They're a scant step up from whiteboards and dry erase markers, in that once the material is learned, they are completely disposable and irrelevant. By constricting the free and spontaneous flow of creativity that may be expressed in the white spaces of children's worksheets, parents may be missing out on some of the best memories of their children's development they could hope to capture. Or at least a great laugh at the their child's visual joke about stinky feet and poot clouds! Oh, hey! One more thing... if you want a great deal on some awesome art curriculum for your kids, act fast. This sale ends soon. The 13th Annual Hatbox Field Memorial Fly-In is coming up October 10 and 11, 2014. This event, hosted by the Three Rivers Area Model Plane Society, draws in model plane enthusiasts from several states, and features all sorts of remote controlled aircraft, including planes, helicopters, an even giant planes with wingspans of more than 10 feet! A while back, my kids had a chance to see a smaller exhibition of model airplanes in flight. They thought these replica planes were awesome. I thought likewise of the pilots, who had the planes doing loops and dives that would rival what we had seen at an air show. 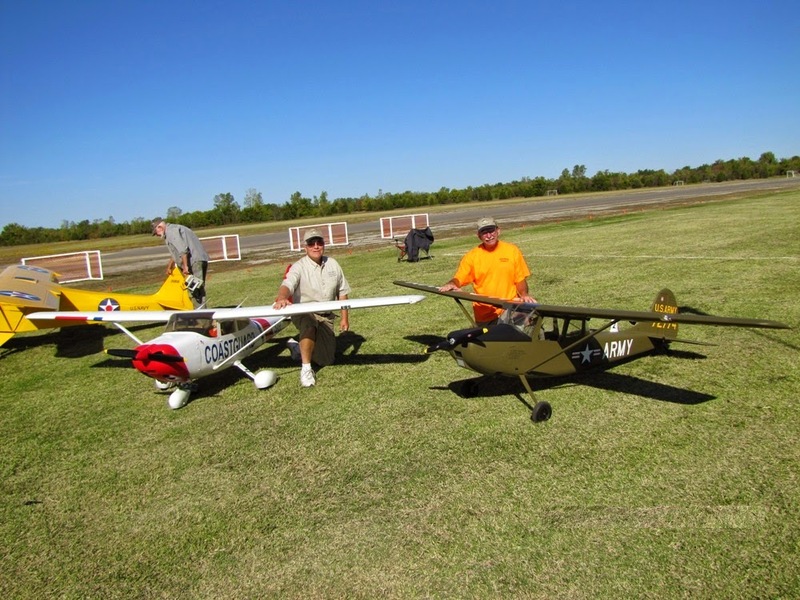 I took the chance after the show to interview a couple of the pilots about how folks could get started with the exciting hobby of building and flying model airplanes. 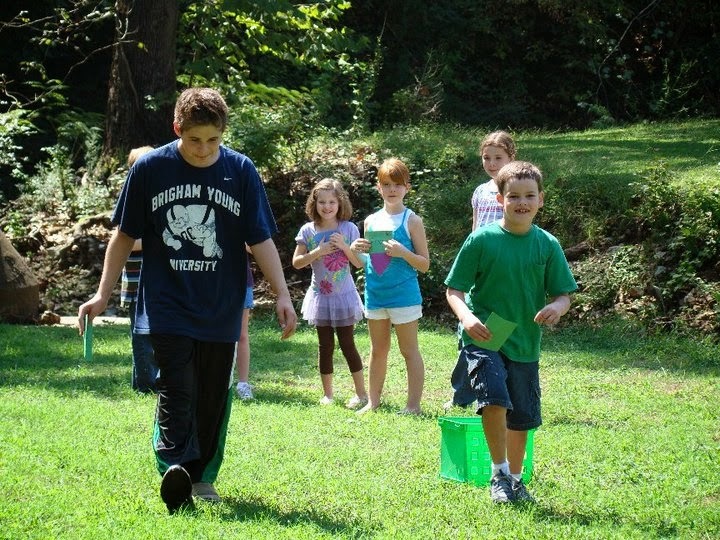 There are so many new homeschoolers this year, more than I have ever seen before! And of course, all the newbies are looking for some advice to help them get started in the right direction. The absolute best piece of advice the Unplanned Homeschooler can give is this: Don’t try to duplicate school at home. As a new homeschooler five years ago, I didn’t know exactly what the veteran homeschoolers I met meant when they issued this warning, but I soon learned. 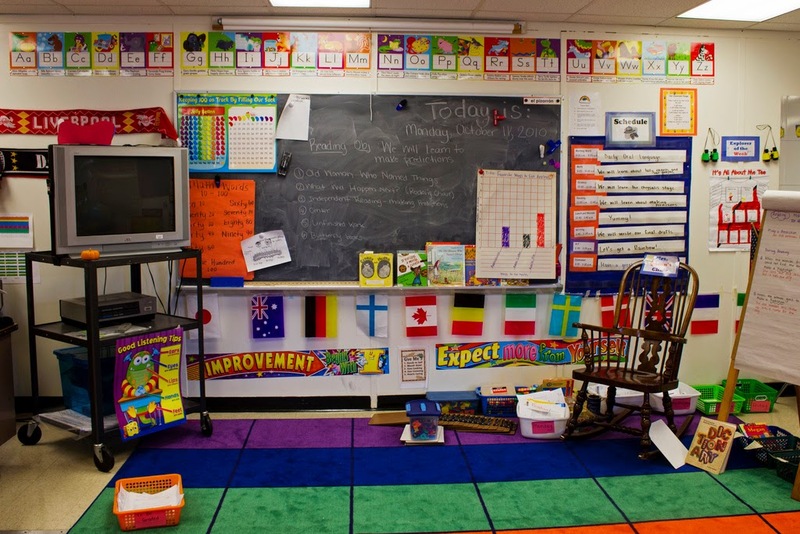 This sort of cluttered classroom environment is probably not best for your kids. I grew up in public school, and my own kids started out there. The public school classroom was the only model of elementary education I had to work from, and while it may be the acceptable standard for simultaneously teaching 20 or more children of the same grade level, it’s not the ideal for most homeschooling families. Fortunately, there are a few easy solutions that can turn the public school experience you probably remember from your own childhood into a homeschool environment much more conducive to educating your children one-on-one. I've seen a lot of buzz lately about postcard swaps. The idea is to find other homeschoolers from around the country, ideally one in every state, and set up an exchange, so that each child in the group gets postcards from all the other states and learns a little bit about history and geography along the way. The idea of a postcard swap sounds neat. Kids love getting mail, and postcards from all around the country could spur a lot of interest in learning about our great states. But organizing a swap can get complicated, especially when trying to exchange addresses and other personal information with strangers you've met online. Parents want to be safe, after all. I figured out another way to fill our mailbox with educational materials from every state, and it was easy and free to do. 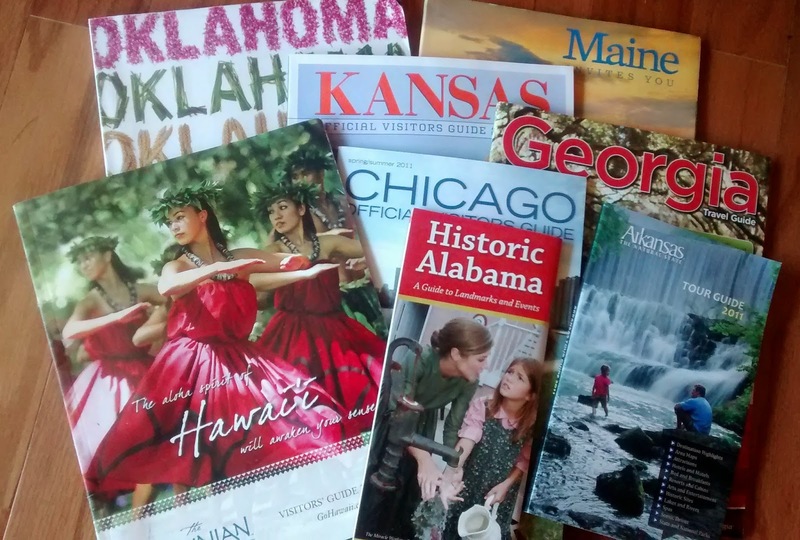 A few years ago, when I wanted to spark my children's interest in U.S. geography and help them learn more about the 50 states, I sent requests to the state travel and tourism offices in every state to request maps and tourism guides for our family. Three years ago, I looked up state travel and tourism offices individually, just doing a search by state names. But another homeschooling mom showed me a site that has links for all 50 states conveniently compiled together, so the hard part is done for you. Some states offered many more resources than just travel guides, free for the asking, including brochures about historic landmarks and battlefields, maps of specific areas of the state, and more. Before long, we had in our hands full color books, from every state, full of information about major cities, state history, natural resources, sports and entertainment, and all sorts of cultural treasures. So, if you are a little wary about participating in a postcard exchange with folks you don't know, or if you happened to miss out on the sign up, consider this alternative. It might be the perfect way to request educational mail for your child, and to stock up on valuable educational materials like full sized state maps. 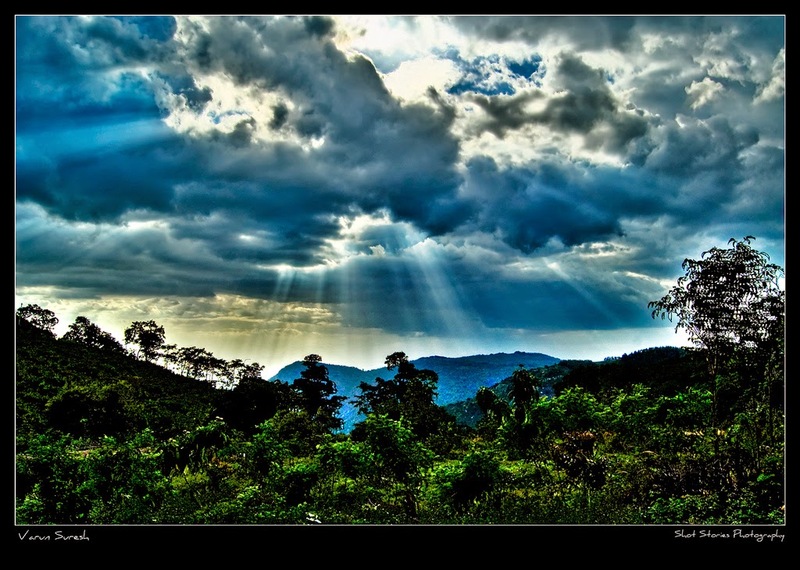 Who knows, you might even find a great place to take a family vacation! School funding for science and other subjects, especially at the elementary school level, has sharply decreased over recent years as more focus has been placed on math and reading. But that doesn’t mean your students have to miss out on great learning experiences. Whether you are a classroom teacher, a home educator or simply a parent who wishes to supplement your child’s education at home, you may be interested in picking up some science kits for back to school. Here are a few favorites for you to check out. You can order science kits that allow you to hatch butterflies, frogs, chickens and more. Bird eggs, like chickens and quail, require an incubator. This can be a little pricey for a single use, but if you have a classroom or a homeschool group that could use the incubator over and over, it’s definitely worth the cost. Frog hatcheries and butterfly hatcheries are a lot less expensive, and can be reused with new orders of eggs or you can find eggs or larvae in the wild. If your student is interested in the inner workings of the body, there is no better way to get an understanding of anatomy and physiology than through a firsthand look. You can get a variety of small animals, including a frog, a fish, several invertebrates and even a fetal pig, complete with a dissection kit and instructions for less than $50. That’s enough for weeks and weeks of lab work and will give your student a look at a wide variety of animal organs and structures. Single animal kits are significantly less expensive. If your students would like to learn about rockets, you have to check out Estes. This company makes a huge variety of customizable rockets available at hobby stores and online. Better yet, they provide lesson plans in information for students and teachers on their website for free. You only need one launch kit, which you can get for under $20 complete with a rocket. Many additional rockets can be purchased for under $10 apiece. There are so many chemistry kits available, or you can basically build your own by purchasing individual chemicals and pieces of lab equipment. 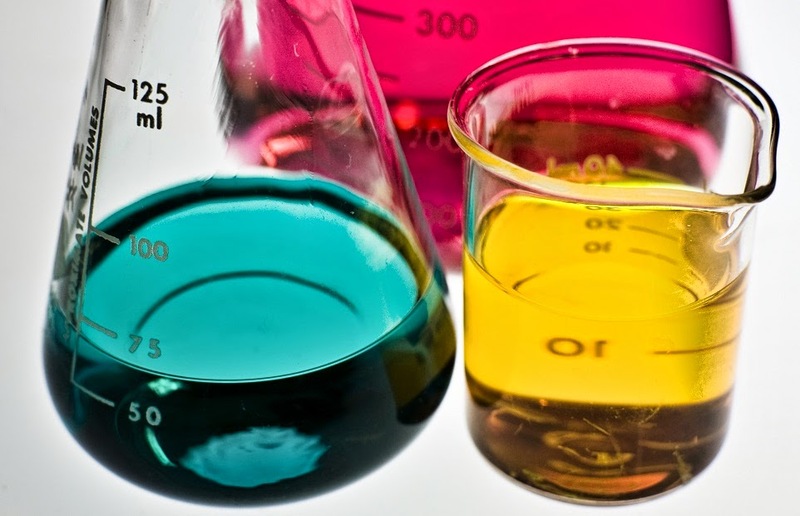 If you are purchasing a chemistry kit for younger students, make sure it has enough materials to do several experiments. I recommend kits that allow you to make slime, grow crystals, and study a variety of scientific concepts. Kits are available to study the bacteria and fungi in the world around you on a basic level or in a more advanced way. If you already own a microscope, you can get started studying microbiology for less than $30, with enough supplies for a whole classroom or for a few students to do a larger experiment. Home Science Tools offers free experiment ideas on their website for everyday science or even for science fairs.